AT 116 PM CDT…NATIONAL WEATHER SERVICE METEOROLOGISTS CONFIRMED A LARGE AND EXTREMELY DANGEROUS TORNADO. THIS TORNADO WAS LOCATED NEAR LANCASTER…MOVING NORTH AT 20 MPH. THIS IS A TORNADO EMERGENCY FOR SOUTHERN PORTIONS OF THE CITY OF DALLAS AND THE CITY OF LANCASTER! SEEK SHELTER NOW! A TORNADO HAS BEEN CONFIRMED! THIS IS AN EXTREMELY DANGEROUS AND LIFE THREATENING SITUATION. IF YOU ARE IN THE PATH OF THIS DESTRUCTIVE TORNADO…TAKE COVER IMMEDIATELY. A TORNADO WATCH REMAINS IN EFFECT UNTIL 800 PM CDT TUESDAY EVENING FOR EASTERN TEXAS. “…At least two “serious” tornadoes have touched down near Dallas, Texas according to reports from news affiliates in the region. Live television footage on CNN and MSNBC showed large twisters ripping through the area, lifting tractor trailers off the ground and tossing them like toys. “I’ve never seen anything like this,” a local NBC News correspondent told parent site MSNBC.com. A tornado emergency warning has been issued by the National Weather Service for eastern Texas and will be in effect until at least 8 p.m. The Dallas Red Cross took to social media in an effort to warn local residents. “…Powerful tornados were spotted on the ground in Texas, carving a path of destruction through the Dallas area and tossing tractor trailers into the air before moving north through the state. Residents in four Texas counties are being urged to take shelter in Dallas, Ellis, Johnson and Tarrant counties. A tornado near Dallas-Fort Worth International Airport ripped through a tractor-trailer park and tossed the massive trucks high into the air and spinning them around before smashing them to the ground. Flattened and crumpled trailers littered the area in the aftermath of the twister. All flights are grounded at Dallas Fort Worth Airport. “…Tornadoes have been reported in Dallas County and other nearby counties in northeast Texas on Tuesday. A tornado passed near the Dallas/Fort Worth Airport, according to CNN, while a second was sighted on the ground in downtown Dallas. Schools in the area were secured for safety. A tornado warning is in effect until 3 p.m. for southwestern Collin County, northwestern Dallas County, southeastern Denton County and northeastern Tarrant County in north-central Texas. Airport officials have been replying to people seeking information via their Twitter account, @dfwairport. They reported no damage from the storms and that all passengers had gotten off planes safely. “If you are inside one of our terminals, please seek shelter in one of the designated storm areas,” a DFW official tweeted earlier. 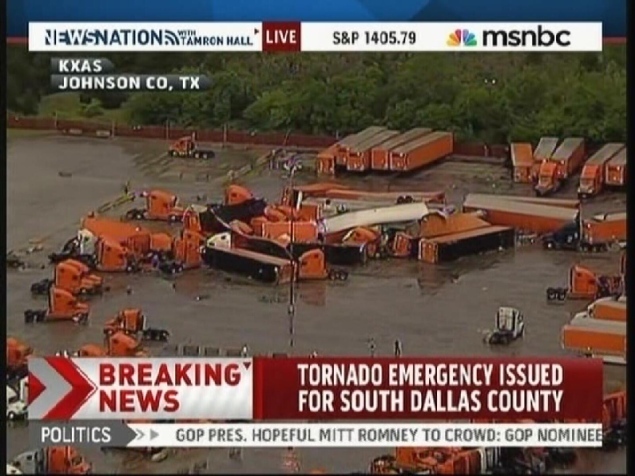 CNN showed video of 18-wheelers being lifted off the ground and thrown through the air by an apparent tornado in Dallas County. 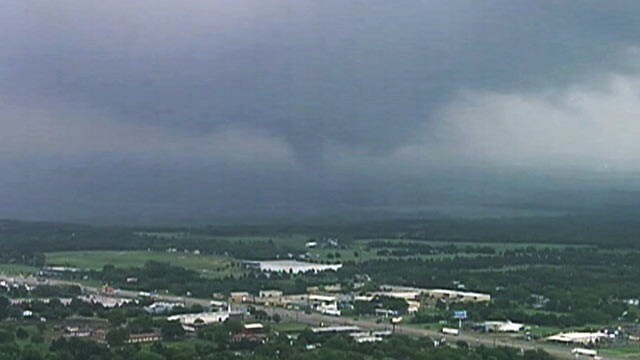 Storm spotters and radar showed more than one south of Dallas and Fort Worth, according to the Associated Press. WFAA reported at 1:54 p.m. CDT that no injuries had been reported at that time, although there was extensive damage. All traffic from Dallas/Fort Worth Airport has been stopped. 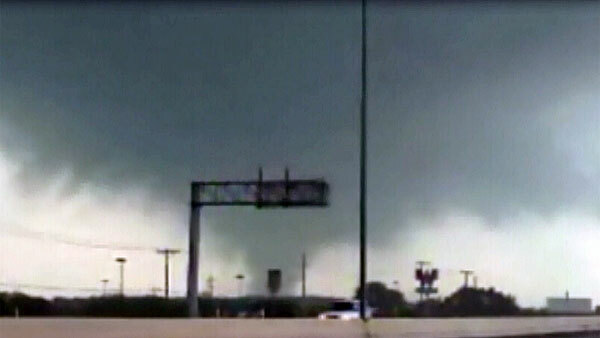 12 Tornadoes Dallas Tornadoes going on April 3, 2012. I’m going to try and provide as many links to videos of news reports and raw footage that I can find. There will likely be lots of videos and I heard news reports of damage and injuries, so pray for my fellow Texans. Last couple of days we also had lots of hail and even tornado warnings down here in south Texas.